Jonathan Kelly, senior director of finance at Grady Memorial Hospital, performs a chair exercise during a Leadership Delaware County class held at OhioHealth Grady Memorial Hospital on Thursday. The nine-month leadership program is offered yearly by the Delaware Area Chamber of Commerce. To run a successful business, you have to know your business inside and out. You have to know your customers, and the community you serve. But to truly connect with the business community, the Delaware Area Chamber of Commerce wants business leaders to know what others bring to the table, and how they all fit to make the area strong. 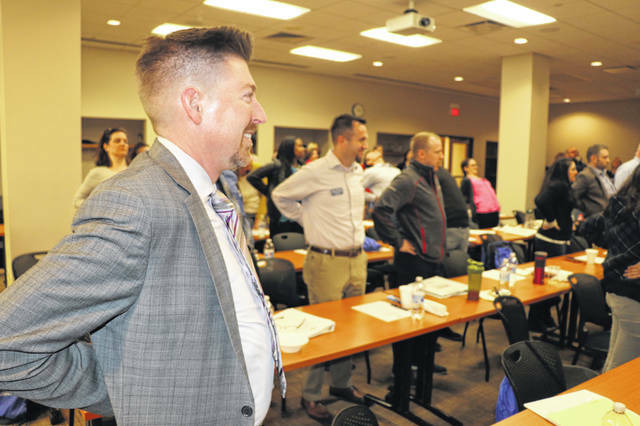 Each year, the chamber puts on a nine-month program called Leadership Delaware County; meeting once a month at a different location in the county. Thursday, the group spent their day at OhioHealth Grady Memorial Hospital as part of Health Care Day. The day started with a community projects discussion, a welcome from OhioHealth leadership, and then a series of speakers from community health organizations, finishing with a tour of the hospital, as well as the Delaware Health Center. For those at OhioHealth, it serves a great chance to pull back the curtain for business leaders, to show what is happening, and where health care is going locally. “It’s so special, and a particular point of pride to have leaders from all over Delaware County come and see our hospital, see what we do here, hear what we do, and experience it as they go on tours throughout the day,” said Jonathan Kelly, senior director of finance at Grady Memorial Hospital. Delaware Area Chamber of Commerce President Holly Quaine said Leadership Delaware County is the flagship event for what they offer throughout the year. She says it has been really powerful to see these men and women form strong bonds that last far beyond the nine months of the program. She also believes this program builds camaraderie for a business community that continues to grow. Tony Benishek, human resources manager for Preservation Parks of Delaware County, is part of the Leadership Delaware County class of 2019. He says this experience has been awesome, adding that he enjoyed the opportunity to see and hear where we are now, and where we are heading in health care. “Seeing behind the scenes is great, and to meet people in person to hear directly from them on challenges they face,” Benishek said. That’s the ultimate goal for a day like this. Quaine said having partners like OhioHealth to host an event like this, and to have others from mental health and general health to present the landscape and keep discussions going, allows action plans to be developed. Plans that only happen with collaboration. “We couldn’t do this without partners. The chamber does the heavy lifting. But, if we didn’t have partners like having an OhioHealth on board, we couldn’t get a panel of clinicians together to speak frankly about what we are all facing in health care. Or maybe in a different month, we have experts that talk about agriculture,” Quaine said. It’s already working for many. “Living and working in Delaware County, you are getting a chance to see a bigger part of the county that I haven’t seen before. Being able to meet so many people within the county makes the program special,” Benishek said. And the hope is, it doesn’t stop here. What comes from these high-level discussions can be a real jumping off point for future collaboration. And more proof that together can really be better in business. “Delaware County is a special place, and we are thrilled at Grady Memorial to be a big part of that. To see the way this program comes together, recruiting new leaders to come through the program is so positive. I think that is such a big benefit for OhioHealth, the chamber, and Delaware County,” Kelly said.